architecture in the town center and around the Old Market. Nowadays, Siem Reap offers a wide range of hotels, restaurants, pubsand shops including several upscale hotels and dozens of budget guesthouses. Often missed are the many opportunities to experience traditional Cambodia: ‘Apsara’ dance performances, craft shops and silk farms, road tours through rice-paddy countryside, boat trips on the great Tonle Sap Lake to fishing villages and bird sanctuary, and much more. Siem Reap, literally "Siam Defeated", commemorates a Khmer victory over the neighboring kingdom of Thailand. These days, however, the only rampaging hordes are the tourists heading to Angkor and this once quaint village has become the largest boomtown and construction site in Cambodia. It's quite laid-back and all in all a pleasant place to stay while touring the temples. It's a nice compromise between observing Cambodian life and enjoying the amenities of modern services and entertainment, thanks to the large expatriate community in Siem Reap. As business has increased, so have the numbers of people wanting your custom, and so have the prices, which are often double or more what you would pay elsewhere in Cambodia. Expect to receive almost constant offers for motodop and tuk-tuk rides, along with everything else which drivers may be able to offer to you. 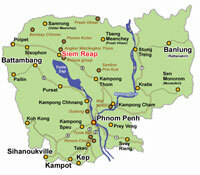 Siem Reap is the nearest town to Angkor Wat. The name Siem Reap actually means the "defeat of Siam" today is Thailand. It is quite a small town and you can walk around to see the city. It is reported to be safe enough to be out after dark. Siam Reap draws visitors for its world-famous monuments nearby: Angkor wat. Visiting the hundred-or-so temples and studying the forests around Siem Reap is still the main reason for being in the city. 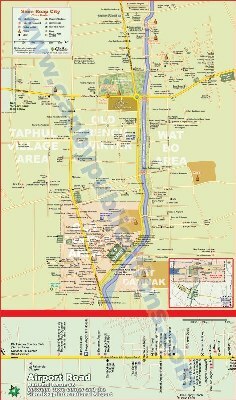 If you are fed up with seeing more temples you can still spend a couple of extra days to relax here and find typ some nice things to do in the area. The huge natural reservoir, Tonle Sap, is just to the south of Siem Reap and provides relaxing boat trips. Banteay Chhmar is located 163km north of Angkor Wat, Koh Ker group 130 km northeasth of angkor, Phreah Vihear temple, Sam Bo Prei kohb group 165 in Kam Pong Thom province and is a reasonable safe haven to visit. The Grand Hotel d'Angkor opened its doors in 1929 and the temples of Angkor remained one of Asia's leading draws until the late 1960s, luring visitors like Charlie Chaplin and Jackie Kennedy. In 1975, Siem Reap, along with the rest of the cities and towns in Cambodia, its population was evacuated by the communist Khmer Rouge and driven into the countryside. As with the rest of the country, Siem Reap's history (and the memories of its people) is coloured by spectre of the brutal Khmer Rouge Regime, though since Pol Pot's death in 1998, relative stability and a rejuvenated tourist industry have been important steps in an important, if tentative, journey forward to recovery. With the advent of war, Siem Reap entered a long slumber from which it only began to awake in the mid-1990s. Today, Siem Reap is undoubtedly Cambodia's fastest growing city and serves as a small charming gateway town to the world famous heritage the Angkor temples. Thanks to those attractions, Siem Reap has transformed itself into a major tourist hub. Siem Reap nowadays is a vibrant town with modern hotels and architectures. Despite international influences, Siem Reap and its people have conserved much of the town's image, culture and traditions.